Two days ago, I blogged about a comparison of the Regular Stock Investment Plans available in Singapore, for those who wanted to take advantage of the Dollar-Cost-Averaging Investment, you may want to check out my earlier post HERE. 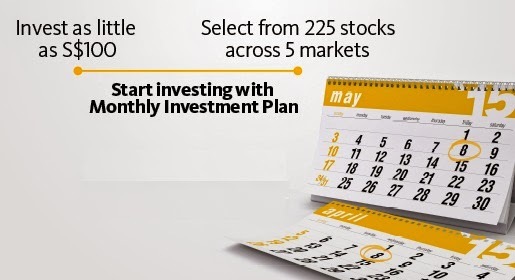 have also briefly touched on the new kid on the block aka Maybank Kim Eng's Monthly Investment Plan (MIP) and their current promotion (till End August 2015, with zero $ commission). I am particularly interested with their offer and have since proceeded to create a trading account online (partly also inspired by LP of Bully The Bear to create as a back-up account, just in case). Once my trading account is done, I intend to start my MIP with them from the month of April or May 2015. As you can see, there are only 3 categories of the counters i.e. REITS, Blue Chips or ETFs. With such strong and diversified counters, there is no issue in counter selection especially for those who aim for Dividend/Income Investment. In order not to face with too many odd lots situation at a later date, I am looking at either one or two counters for my MIP only. so u gonna purchase all these counters ? Serendib : Sorry, I can't share my experience as I didn't use KE ultimately after I learnt that there will be charge when you are selling your holdings. I guess there are still some additional costs that we need to take into consideration.